Built on the Woven Calendar Graph, Woven is an intelligent calendar for busy professionals. Woven works with Gmail and G Suite accounts (and not with Office 365 and other calendars yet). • Set templates for different meeting types. Any aspect of a meeting from participants to availability window can be preset in a template. • Schedule complex meetings or send collaborative scheduling links from your phone with just a few taps. • Convert any meeting into a template and customize for future use. • Eliminate the scheduling back-and-forth: Suggest times and send actionable links via email or messaging. • Let others pick a suggested time and schedule the meeting with a single tap. No need to have Woven installed. • Securely and easily share your availability with trusted friends and clients you meet with most. 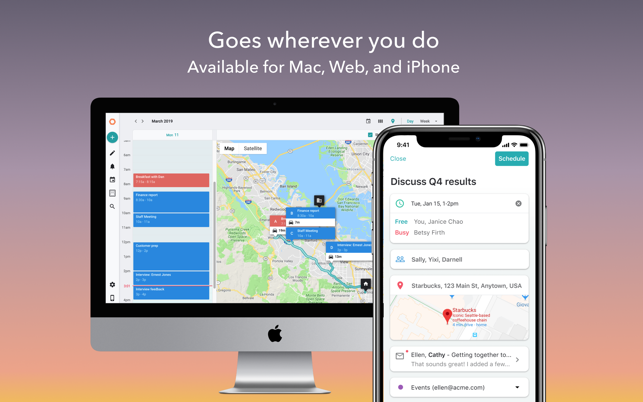 • Public scheduling links (woven.com/calendar/[yourlink]) allow anyone to book meetings with you based on your customizable availability window. • Display your entire day on a map with automatic travel time accounting for traffic at the time of each meeting. 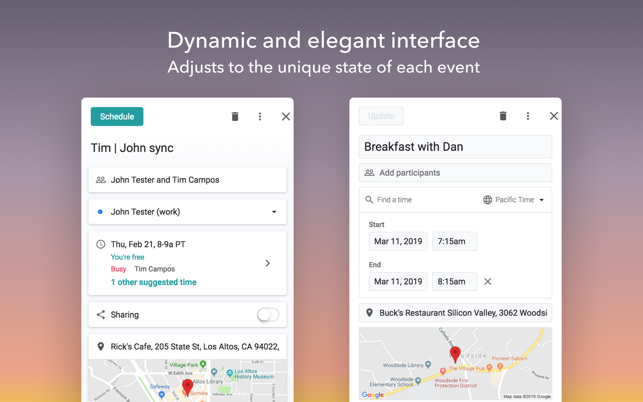 • Move events to see in real time how your travel routes and times change based on a new event time and transportation type (car, train, bus, etc.). • Block travel time on your calendar for an entire day with a single tap. 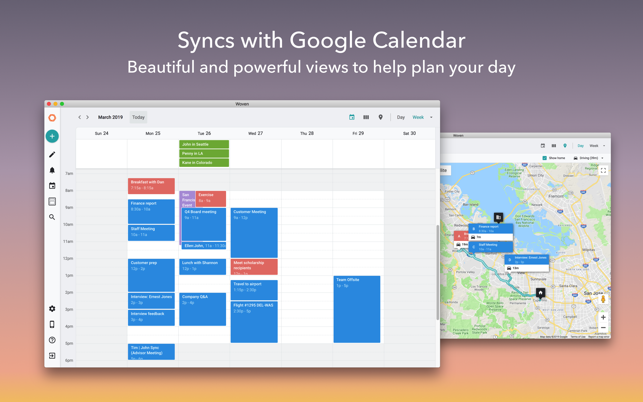 • My Time: consolidate your work and personal calendars. Woven considers all My Time calendars when finding available times. • Add your conferencing information to events with a single tap (works with Zoom, Skype, WebEx and many others). • Put private notes, tags and locations in meetings, only visible to you. • See emails related to an event right inside Woven. • Keep track of events yet to be scheduled in the Planning tab. • Receive updates from your My Time calendars in a single place. • Resolves issue with some links not opening. It doesn`t work. At all. After askin for the login and pasword it restarts from scratch. @boronbekov, we're very sorry that you had this experience. The problem you experienced sounds like a confusion a few other people have had as well with our UX for signup. We're working on cleaning this up as we speak to eliminate this confusion. However, in the meantime, you can simply signup via our website at https://woven.com/signup. Once you sign up, you should be able to log into the desktop app. 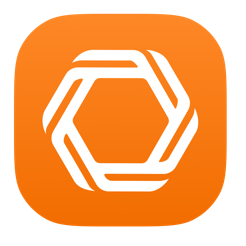 © 2019 Woven Software, Inc.